Can anyone recommend this book? I started Eat, Pray, Love: One Woman's Search for Everything across Italy, India and Indonesia, by Elizabeth Gilbert, months ago. The author traveled through Italy, India, and Indonesia -- although I don't recall exactly what precipitated this journey -- and the book lost my interest while she was still in Italy. This is the "eat" part of the book -- surely that would be the part of the book that would interest me! But as I recall, she really didn't tell us much about what she was actually eating. I tried to pick it back up but now I don't remember why she is on her trip and I don't have much interest in re-reading what I've already read. Has anyone read this and liked it? Should I revisit this book or toss it in the garage sale pile? There are guys who like to cook. I love guys who like to cook. There are guys who love to eat. I love guys who love to eat. And then there are male foodies. Male Foodie Type 1: Those that collect restaurant experiences like little boys collect baseball cards. When the topic of food or restaurants comes up in conversation, the conversation turns into a competition about whose experiences are more impressive. You can often find these types hanging around the regional forums at eGullet. Male Foodie Type 2: Those who recount meals in detail in conversation. Whether it's meals they've cooked or meals they've eaten in restaurants, they tell you about them in excruciating detail and it's rarely interesting to listen to. It's like someone trying to tell you about the funny bits of a movie -- it's just not the same second hand. Male Foodie Type 3: Those that cook as a way to show off. When you go to their house for dinner they spend a lot of time sweating in the kitchen, and they expect oohs and ahhs when they present their meals with a big flourish. - Those that ask questions fit for Alton Brown (Why do you do it that way? Does that cause the starch molecules to bind with the water molecules?) and decide the instructor isn't worth his/her salt when she answers "because that's the way you do it." - Those that try to stump the instructor or find flaws in his/her methods. - Those that find ways to show off their own knowledge at every opportunity in class. - Those who look down their noses at everyone else taking the class, especially if his fellow classmates want to relax and enjoy themselves instead of acting as if they are in medical school. When I started reading The Saucier's Apprentice by Bob Spitz, he clearly fell into Male Foodie Type 3, having friends over for Friday dinners, during which his love interest criticized him for the weekly melodrama. She ended up becoming a villain in the book, and I think this scene was meant to foreshadow it, but at this point I got her. Next he impulsively decides to spend three months hopping among various cooking schools in Europe and doing stages in restaurants to really learn to cook -- leaving behind his 11-year-old daughter, who is supposedly the light of his life. Huh. I just don't get people who leave their kids for months at a time, even less if it's to pursue a hobby. So by page 30, my biases disposed me to just not like the author. The high points of the book are when he does stages at European restaurants (although I don't recall him spending a lot of time working with a saucier, so the title of the book is a bit misleading) and chefs treat him like dirt. But then he either pouts or whines about it and eventually leaves the restaurant with some prized recipes. The book was interesting enough that I finished it (although in my current post-surgery situation it's not like I have a stack of good reading material to choose from). Really, he's a decent writer and probably even a decent guy. In fact, if you fit into the one male foodie types listed above, you probably will love this book. Otherwise, you're better off with the book I mentioned below. During my recuperation from appendix surgery, I haven't been cooking or even eating much (what little appetite I have craves comfort food like roast chicken, mashed potatoes, Frosted Flakes and Pop Tarts). During the times I'm not dozing, I've been doing some reading. A couple of books have been mind candy -- not worth mentioning -- but I did want to mention The Sharper Your Knife, the Less You Cry by Kathleen Flinn. It is the author's account of a year at the Cordon Bleu cooking school in Paris, interwoven with the tale of a blooming romance. She uses the lessons learned in cooking school as metaphors for lessons about life in general. Although I never had an interest in attending the Cordon Bleu -- and have even less now that I've read the book -- the writer tells a good story and I thoroughly enjoyed it. It's a great summer read. The other night I made a double batch of good jasmine rice, then had fewer people for dinner than I expected. The next day, I put the leftover rice to good use by making a yummy veggie fried rice. I turned to Steamy Kitchen, one of my favorite food blogs, for inspiration. 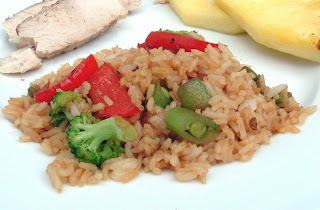 I loosely based my lunch on this recipe, using veggies and ingredients I had on hand, and it turned out great -- much better than the fried rice an ex- boyfriend of Asian descent used to make for me ... but we won't go there. Anyway, here's how I made mine. I served it with a few slices of leftover grilled chicken and a few slices of pineapple. 2. Add rice. Add remaining soy sauce, sesame oil, ground ginger, salt & pepper. Fry on high heat until the each rice grain is heated through. Taste. Add a touch more soy if needed. I am contributing this to the Bookmarked Recipes blog event at Ruth's Kitchen Experiments. 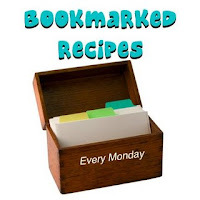 Check on Mondays for more recipes! I am a Throwdown jinx! First it happened to Bove's, probably the best restaurant lasagna my husband and I have ever tasted. Bobby Flay challenged them to a "Throwdown" and Boves (shockingly) lost. Next it just happened to the Peninsula Grill, one of our favorite restaurants in one of our favorite cities -- Charleston. I'm starting to think that the two of us having visited a restaurant jinxes it! 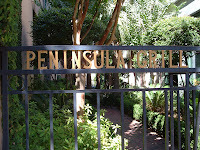 I wrote about our 2006 visit to the Peninsula Grill here. After the meal, I told my husband that if we had a chance to return to Charleston, I'd make a reservation there every night, and we could eat our way through the menu. He didn't think that was a bad idea. Sadly, there won't be a chance to return to Charleston with Southern Living Magazine footing the bill, because they discontinued their annual recipe contest -- a real bummer, because that was my all-time favorite cooking contest to date. Anyway, back to the episode that featured the Peninsula Grill. The challenge was coconut cake. When I saw the title of the show, I squealed, "COCONUT CAKE -- you'd better be going to Peninsula Grill!!!" Yeah, I know yelling at the TV is embarrassing, but it runs in the family. My husband yells at Bills and Sabres games. I yell at cooking shows. It freaks out the dog, but we can't seem to help ourselves. Before I went to the Peninsula Grill, I wasn't a fan of coconut cake. 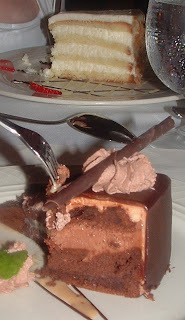 As a result, I ordered a chocolate cake, which is in the foreground. And it was deee-vine. I tasted the coconut cake at the urging of the editor of Southern Living, and the moist cake with lots of rich coconut cream cheese icing made a convert out of me. In fact, it took all the restraint in me to stop at a polite-sized bite of his piece. I've had coconut cake since then, and I've enjoyed it, but none have been as good as that one. Bobby Flay countered the Peninsula Grill's with a lighter cake with a coconut custard filling and a coconut buttercream. I don't even have to taste the two to know I'd prefer the Peninsula Grill's version. I hate custard filling in general, and I love cream cheese icing. Here's the thing that's weird about the show. To be really fair, food judging should be done "blind." The judges they pick for "Throwdown" are local. The restaurants they go to are local institutions. As a result, the judges are likely to be very familiar with the restaurant version of the dish they are judging. 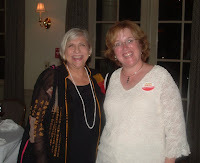 For the coconut cake challenge, I'm pretty sure Nathalie Dupree was familiar with the coconut cake at the Peninsula Grill -- because she was at the same dinner I was at, when the coconut cake was served! Maybe she didn't eat the coconut cake that night, but given that Nathalie Dupree is a Charleston institution in her own right, it's highly likely she's eaten that cake. In the end, I suppose it doesn't matter much. The Food Network appears to do a very good job of scouting the "best" of a given dish, so win or lose, it's good publicity for the restaurant to be on the show. And Bobby does have to win once in awhile, or the show would be boring. Even so, I wish Bove's and Peninsula Grill would have won! When I'm having lots of children at my house, such as for my son's baseball team pool party, fruit is always on the menu. In the past, I've served it various ways, from fruit salads to fruits on a skewer. They look great, but the trouble is that lots of kids don't eat every fruit. As a result, I'd find pieces of various abandoned fruits on plates as as I cleaned up -- what a waste! I've decided that the best way to serve fruit for a cookout with children is a nice platter of seasonal fruits with a dip on the side. Not only does this result in less waste, it's also quicker to prepare. I do wedges of watermelons, grapes cut into little bunches, strawberries with the stems attached, and so on. 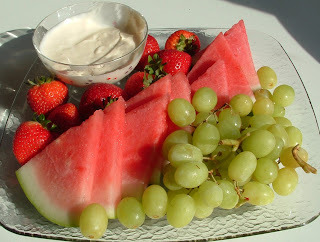 Here's an easy, basic, creamy fruit dip that I've served a few times. I like it best with tart fruits, like strawberries, pineapples, and tart apples. In a mixer bowl, use an electric mixer to whip the cream cheese until fluffy. Add the sour cream, sugars, maple syrup and vanilla extract. Mix until smooth. Fold in the whipped cream. Serve immediately or chill for later.